Dinosaur Milk? Science Says "Maybe"
You could have had your corn flakes with T-rex milk. What a shame. Physiology professor Paul Else has been studying the link between dinosaurs and modern day birds for quite some time, and while the ancient animals have been cast as fearsome creatures by some, Else believes dinosaurs were outstanding parents. In fact, his research has pointed to the possibility that dinosaurs even produced milk for their young. Unlike mammals, Else believes that certain dinosaurs may have had the ability to generate a "milk-like substance" in their esophagus, much like some birds do today. 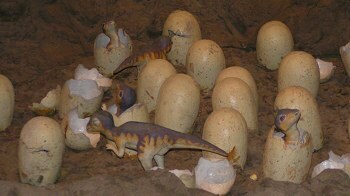 "Hadrosaurs were herd, site breeders with nest bound young fed by parents," Else explains. "The proposal is that rather than regurgitating partially fermented plant matter these dinosaur parents initially used lactation then progressed to plant regurgitation." In birds, the milky substance is laced with hormones that boost the growth rate of the offspring. Dinosaurs may have used their own milk to do the same for their young. If further research into Else's theories proves fruitful, we may learn a great deal about the parenting habits of all manner of dinos.